Every year, the world of digital marketing meets at DMEXCO. The first port of call for the global top media brands is the Motion Hall, which opened in 2016 and, with a 22-metre wide LED wall, provides a fitting backdrop to the hot topic video. As in the previous year, the RTL Group was one of the headliners. K16 was commissioned to create an event presentation to suit the occasion and that provided an appropriate and consistent framework for the various speakers from the RTL Group network. To utilize the huge LED wall in an engaging manner, K16 created a presentation master in Apple Keynote for the event. On this basis, the content prepared by the RTL Group was creatively edited and a harmonious overall concept was developed in close cooperation with the RTL Group and the creation of the media group RTL Deutschland. 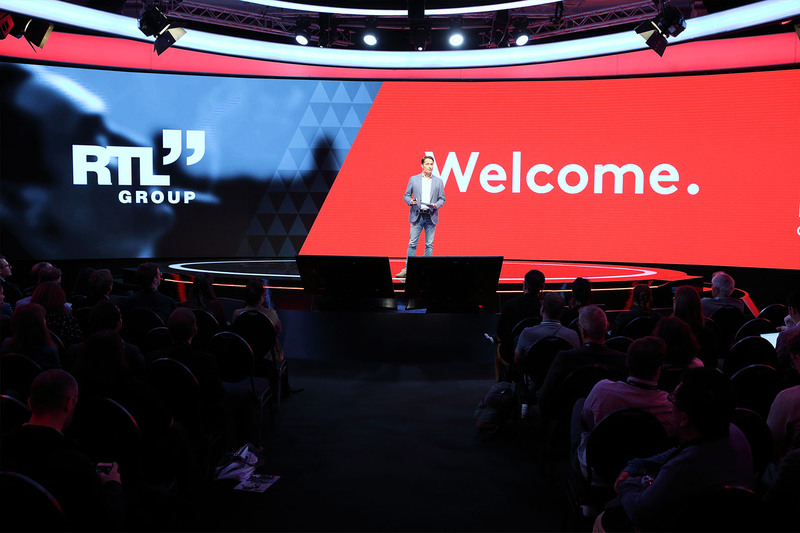 In addition to the exciting presentation of the content, the show presentation that was developed also made it possible to seamlessly incorporate RTL Group trailer videos and the performance of a show act. Furthermore, K16 also assisted the RTL Group team at the event to set up and control the presentation and provided technical support. The result: a spectacular and highly consistent presentation.